I've been putting together some planar magnetic loud speaker drivers. There is a wealth of information available at diyaudio.com, particularly in this thread. 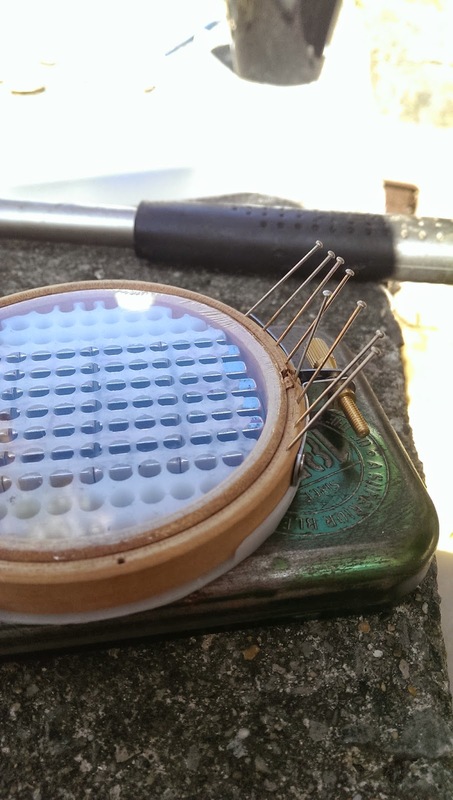 Inner Fidelity have a nice write up on planar magnetic drivers. 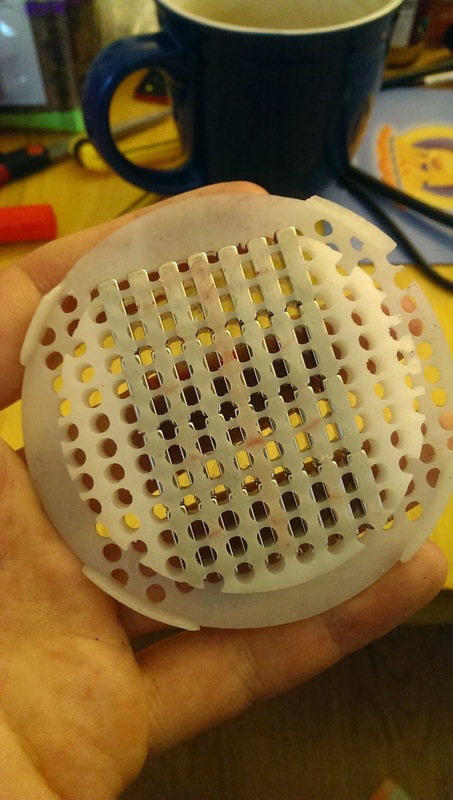 Euwemax documents his DIY planar magnetic drivers for headphones, and he uses etching as his principle method. I thought I'd attempt to build some using enamelled wire and embroidery hoops. This post documents my progress so far. I've made working prototypes, but at the moment the sound is clipping. From what I have read of other peoples methods, the most tedious part is glueing lots of magnets into a grid pattern. This is complicated because the magnets are closely arranged in patterns of repulsing fields. 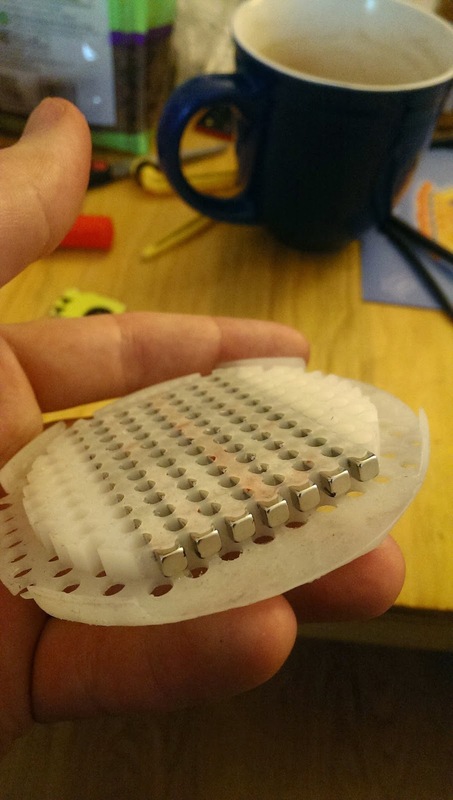 To get around this, I have designed and 3D printed a bracing mechanism for the magnets. The brace has lots of holes to allow air pressure to move from the front to back of the driver (and vice-versa). The top of the brace is 0.5mm thick. This would be best as thin as possible, so I will make some more experiments here. The magnets are best elevated to be as close the diaphragm as possible. You can see above that I push the magnets in with a stick. The fit is very snug. I'm using 15x4x4mm neodymium magnets. I've printed this on a Form 1+ machine using a photocure resin. I'll publish the STL file to 3D print once I have finalised the design. 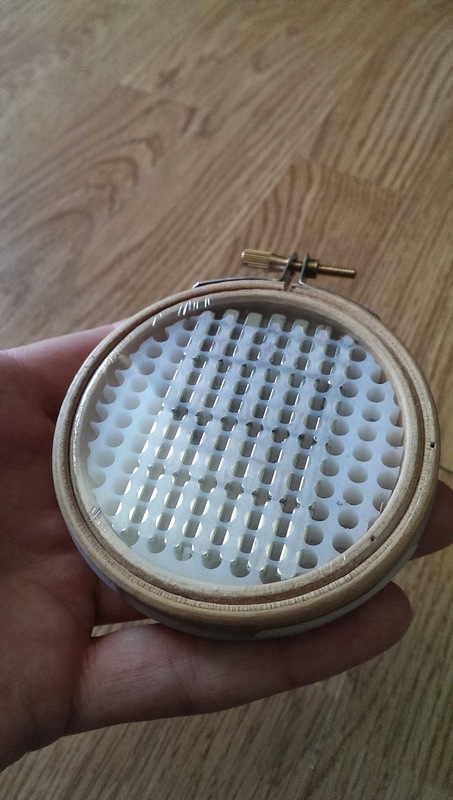 It is designed to clip on to an embroidery hoop. It will need redesigning for fixing points, whether this becomes a set of headphones or a loudspeaker. For the diaphragm I have used kitchen cling film. I simply fix it into a 3" embroidery hoop as if it were a fabric. I have pulled it as taught as possible. I then hovered it over a lit gas hob to further tension the film. I was surprised at how quickly the cling film melts. You can see the film tension, and you only need to wave the film about 60cm above the heat source. 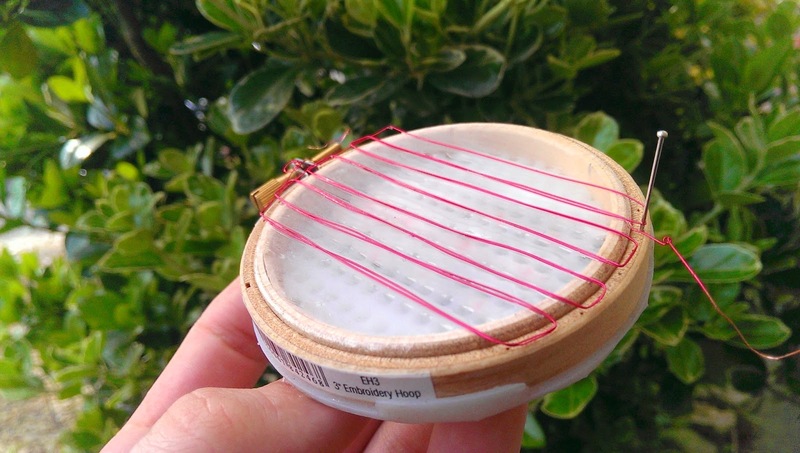 The double ring of the embroidery hoop works to advantage in this step. 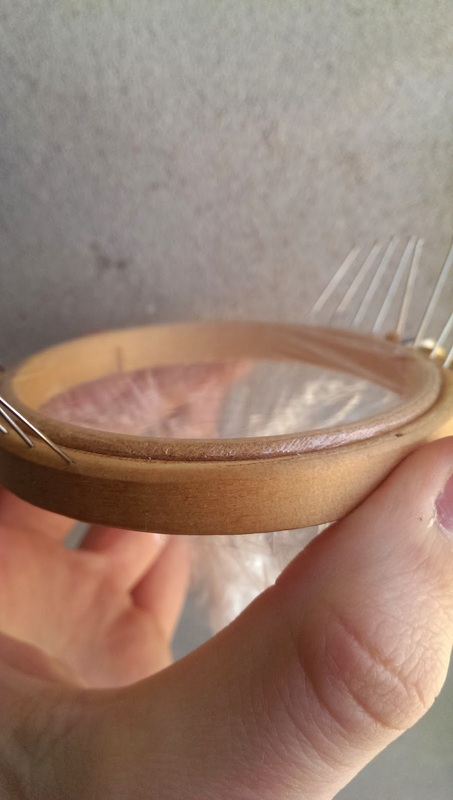 Observing the grid lines of the magnets, I inserted pins into the outer wooden ring of the hoop. This pins are used to wind the coil back and forth. The pins in this outer hoop don't cause any damage to the diaphragm. Insert the pins at an angle, as if staking a tent. 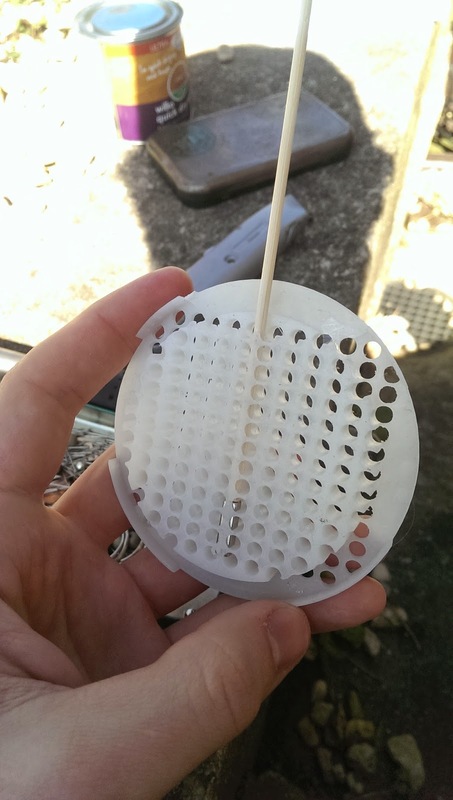 This means that the wire will slide down the pin and sit close to the diaphragm. It also helps to have the inner ring slightly raised, again to force the wire to lay across the diaphragm. 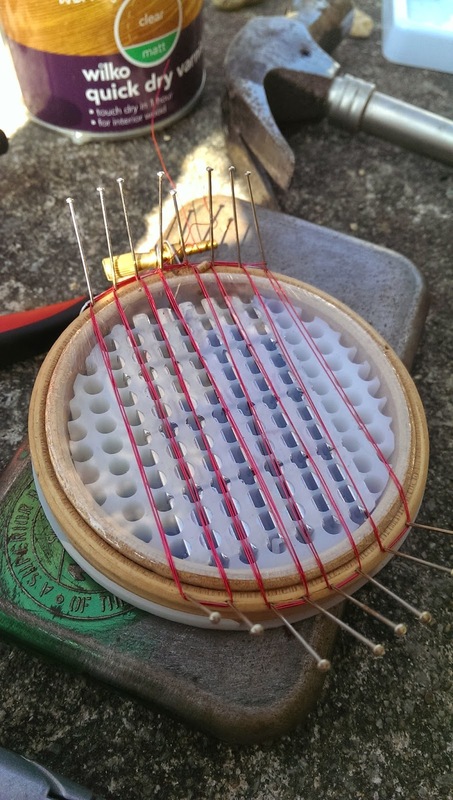 The next step is to wind a length of enamelled wire back and forth between the pins. The pattern is shown below. The principal is to take wire down one side of a line of magnets and up the other. My winding here is pretty rough, but at this point I had no idea if this would work at all, so I was just working quickly to prove the concept. In the background is a tin of polyurethane varnish. This is another crucial step, but hard to document photographically. 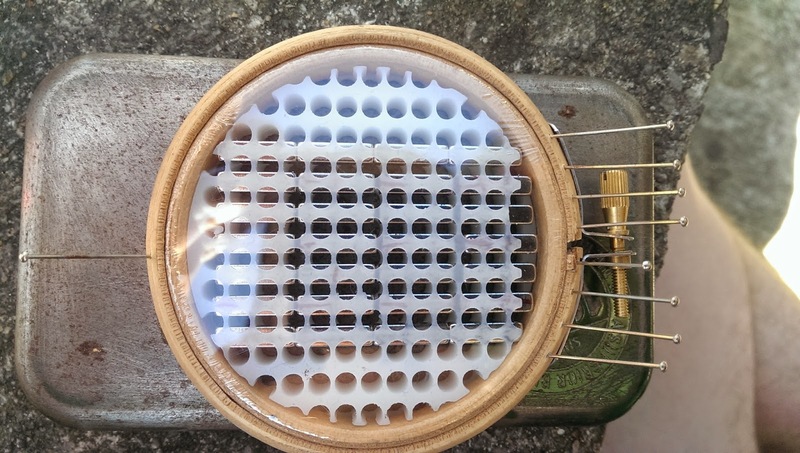 I varnish is used to bond the wire to the diaphragm. I watered the varnish down with about 20% water. I then used a soft paintbrush to paint over the diaphragm and wires. 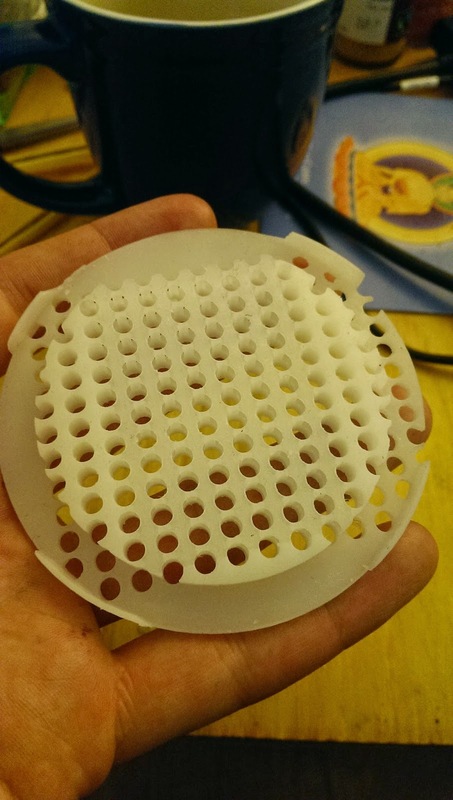 Ideally you want a light diaphragm. The varnished dried within a minute or two in the sun. 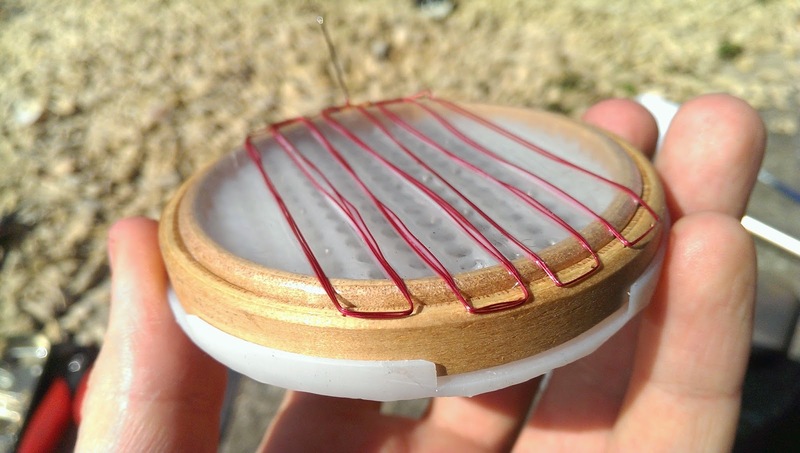 You can then remove the pins, and the wire is stuck to the cling film diaphragm. I'll be conducting more experiments on the number of windings, the proximity of the magnets, and the overall size and shape of the driver. I plugged this drivers into a 60watt amplifier and got audible music, but he sound was clipping. I'll need to do some reading and investigating to find out how this can be remedied.